From simple single-zone manifolds to multi-manifold systems, we can install irrigation for your landscape. 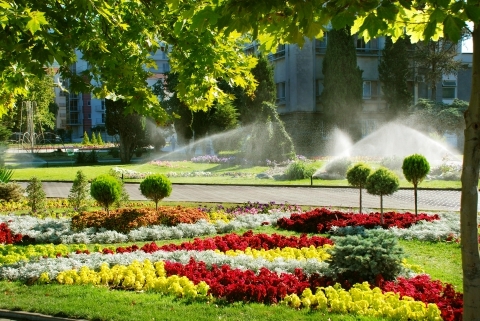 Irrigation is what keeps your plants, trees, and lawn lush. If your landscape is full of foliage, it’s likely that you’ll want to install sprays and/or drip irrigation lines. We can install these systems how you’d like, and we can bury our lines in trenches if you’d like to keep your landscape looking natural. We’ll formulate a plan for various zones throughout your property and we’ll make sure that each plant has a source of water. We can even recommend watering cycles for your zones to make sure that your plants thrive. Trees need water too! Drip lines are a popular option for trees since they can be buried and kept discrete. You can even place mulch over a drip system to hide it from plain view. Again, it’s our goal to ensure that your trees have a sufficient source of water. Most folks opt for in-ground sprinkler heads that pop up for a watering cycle. We can install irrigation lines, manifolds, and the sprinkler heads that you desire. We aim to provide complete coverage for your lawn so that every blade of grass grows green. Larger lawns will need to have separate zones for watering or else they won’t receive enough pressure for complete coverage. Curious about our irrigation services? Feel free to get in touch with us today to learn more. We’ll also give you a free quote while you’re on the line!